Walking through an airport, fair, or even some shopping malls, we have all seen the nut vendors. These are so expensive to buy, but guess what, you can make these quickly and easily at home. These nuts are simple to make, and cost so much less than what you might purchase them for. You may even want to make a double batch. These are the candied nuts that you find in malls, fairs, and at airports. Combine sugar, and all spices, water and the egg white in a bowl and mix well. 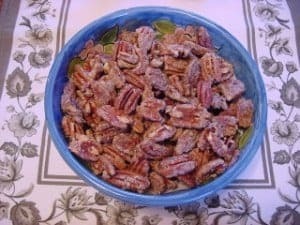 Add pecans, and stir until they are well coated. Spread in a lightly greased foil lined jelly roll pan. Bake at 275 degrees for 50 to 55 minutes, stirring every 10 minutes. Remove from the pan, and allow to cool on wax paper. When nuts have cooled store in an airtight container. I will be making these for Christmas next year. I bake for my friends at Christmas instead of going shopping for gifts.